Hoping Everyone had a Fabulous July 4th & TGIF !!! I took the quiet route for the 4th and relaxed at home, especially with New York sizzling yesterday, clearly giving us a taste of what summer has in store. Today was another hot sizzling day with a big mix of humidity. I stayed in my sewing room fiddling and twirling over what to sew. While talking to a dear sewing diva, the topic of blouses came up and I remembered New Look 6915, which was oddly already in a pile on my table. That was a clear sign that it was meant to be sewn and sew I did. New Look 6915: tunic top with neckline variations and different lengths. Just last week I wore one of them... they make great wardrobe staples.. This dolman short sleeve & loose fitting top provides the perfect ethereal style for the summer. 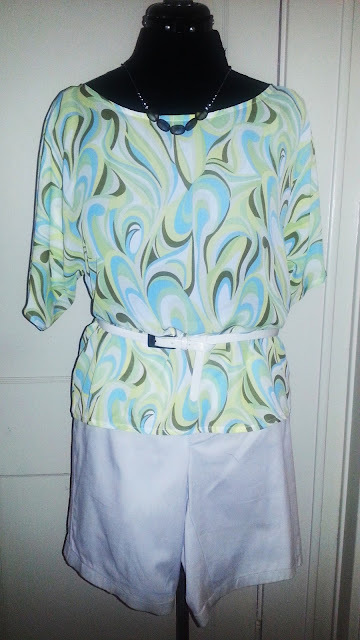 Of course, I couldn't make just one.... lol ... another printed chiffon for my refashioned white pants to shorts. Ms. Sheila. I love all of them. Great use of the pattern. This top is a classy chic wardrobe builder. I especially like the yellow and pink top. I love that color combo. Sheila, these tops are lovely! Lady, you really make these tops in great looking fabrics. If memory serves me correctly, I was supposed to try my hand at these. Lol I love these tops paired with the shorts! Great job. They are beautiful tops. You look great in them. This is a great go to pattern for tops. I really like all of your versions. 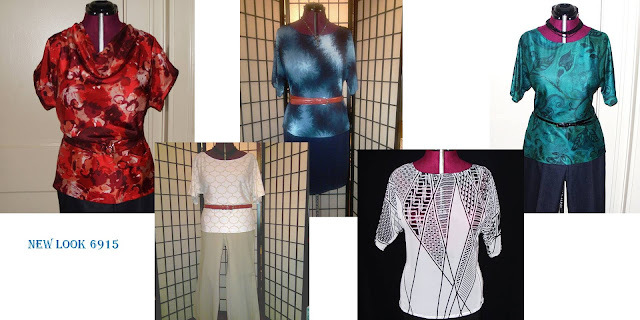 Awesome, you took the pattern to the Max and created beautiful, timeless, elegant and casual tops. I like the last one with the white pant. Sheila you have the prettiest fabrics/prints. Love your new tops and I do remember when you used that pattern for the sew-a-long. Thanks again for always joining in! Cennetta said it best! Well done. Great tops! Perfect summer wear. Thanks Cennetta, I really like the fact that it works so well with a variety of garments. Thanks Adelaide... The two colors remin..lold me of lemon/cherry swirl italian ices. Thanks Brenda, I hope you get a chance to make it ... great pattern and provides instant gratification. Thanks DK's Wife, I enjoy a simple top and especially when its a wash & wear. Thank you Linda, I have worn some of the tops through the winter months with suits and they fit comfortably under the jacket. 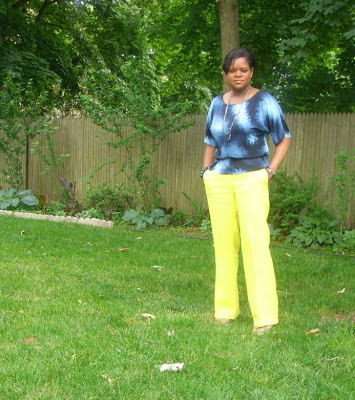 Thanks Alethia, nothing like a go to pattern that can be dressed up or down. Thank you Faye, your sew alongs allowed me to create pieces that continue to wear well ove the last few years. These are really very nice tops and look so comfortable and chic!!! Great job! Beautiful tops, and I love your refashioned shorts too. That looks so comfortable.Your romping with the dogs demonstrates how easy and comfortable the top is.Easy to move around in. Hi Myra and Thanks. It's really comfortable and wore the 2nd one the next day. Perfect for New York's heatwave. Hi Sister and Thank you. You really are spot on with your tops. You always pick great colours and prints. Don't you just LOVE those clear signs! 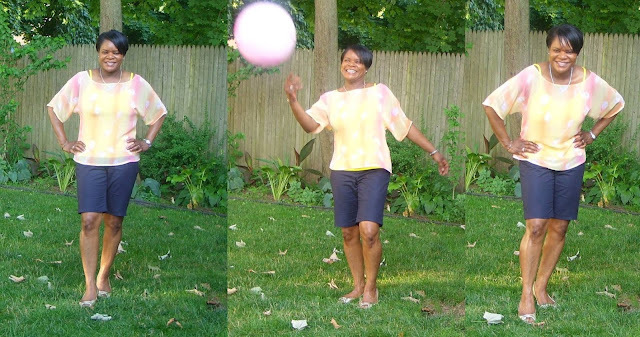 Love how you styled your top with the refashioned shorts. I keep wanting to get to a shorts pattern but may have to reconsider a refashion. Very nice!